The 3 point linkage was the design for which Harry Ferguson was most famous. By mounting the implement, initially ploughs, on the tractor (rather than towing it) and using hydraulics to raise and lower that implement Harry Ferguson revolutionised agriculture. The 3 point linkage grew initially out of the Duplex Hitch which he had designed in the early 1920’s. The draft control principle that he had patented in 1925 involved the provision of two hitch points. It was with the provision of the third hitch point that in 1928 he applied for a patent which effectively became the 3 point linkage. 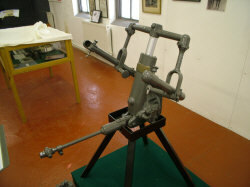 The unique exhibit in the Ferguson Family Museum is the first prototype of this 3 point linkage which has been in the family ever since. It is extraordinary in that it has two upper links and one lower link whereas ever since the 3 point linkage has consisted of two lower links and one upper link. Harry Ferguson quickly recognised the problem of the linkage geometry and turned the invention upside down! The 3 point linkage went on to become the key design feature of tractors and enabled tractors worldwide to carry a vast array of implements with improved safety and traction.